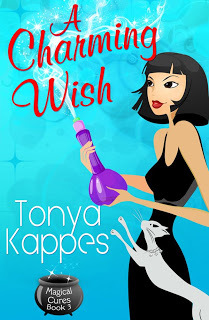 In A Charming Wish by Tonya Kappes, June is once again embroiled in a mystery and this time it landed at the door of her shop...literally! Who killed Kenny? Ugh...the author really needs to stop making references to pop culture. Anyway, June needs to figure this one out because unlike before she really is in big trouble with a capital "T". And to top it all off, she's just been named Village President. Worst of all, there have been some additional crimes around town and her name is written all over them. An ostrich is missing, the recipes for June's Gems has been stolen and now June has been banished from Whispering Falls until this whole thing can be sorted. Does someone have it in for June? Well, she's not going to sit this one out, no matter what the Order of Elders tell her. She has to find out who is involved in all these horrible deeds, no matter how bad it looks around town that she has been asking a bunch of questions. June will now have to be resourceful and use her sleuthing talents to find the answers she seeks. Along the way she gets a little help from a few people and begins to piece together the clues one by one. Too bad that Oscar...whoops! Oh no! I am not going to reveal that secret! You'll just have to read the book to find out. I found that this story was delightfully refreshing after the dismal failure of the previous one. Despite the one reference...well two if you actually think about it, but truthfully, it was fun to actually see how the two support characters of June actually went at it with each other. It made for a nice twist on the antagonist part of the storyline and kept your mind off of the mystery, or shall we say, several mysteries going on. 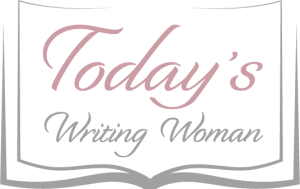 There is sort of a sad part to the story that affects two of the characters, but I will leave my readers to find that out. Needless to say, I don't think this is the end of June, Mr. Prince Charming, Oscar and the rest of the residents of Whispering Falls. Ms. Kappes, you have redeemed yourself!